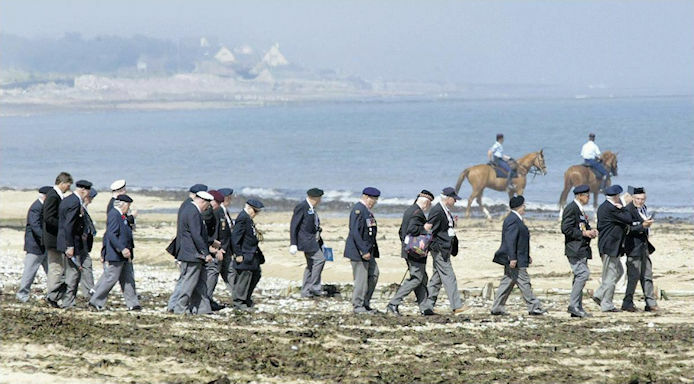 Canadian veterans walk along Juno Beach after a ceremony marking the 60th anniversary of D-Day in Courseulles-sur-Mer, France on June 6, 2004. Second World War veterans and others are concerned about a proposed wind farm 10 kilometres off the coast. For decades visitors to the D-Day beaches on the northwest coast of France have looked out at the English Channel, taking in the journey made by Allied troops that marked a turning point in the Second World War. The view from some of those sites - including Juno Beach where 359 Canadians died - could soon change if a plan succeeds to build an army of wind turbines some 10 kilometres offshore. Canadians now have a chance to voice their opinions on that plan as a French commission holds public consultations on the project. The body has made it a point to invite people from Canada, the U.S. and Britain to weigh in and notes that even if the project goes ahead, the company building the 75 turbines will work to deal with the issues raised. The entire turbine proposal rankles at least one Canadian who fought at Juno Beach. "I personally am very much against it," Roy E. Eddy told The Canadian Press. "I know a number of people have said they don't agree with me, and I'm not disputing that, but I still say it's going to be very disrespectful." The 88-year-old, who last visited Juno Beach three years ago, vividly recalls the battle. "I still have nightmares about it," said Eddy, who served on the frigate HMCS Outremont but was assigned as the crew of a landing craft on D-Day. "I had about 35 men in my landing craft, they gave me the signal to drop the ramp ... only nine got off alive ... I lost a lot of very good friends." The federal government, well aware that some Canadians disagree with the French plan, says it's tracking the progress of the proposed wind farm. "We understand and share the concerns of those who fought for freedom," said Jean-Christophe de Le Rue, a spokesman for Veterans Affairs Minister Steven Blaney. "Minister Blaney has asked his senior officials on the ground in France to monitor the situation and to report directly to him." Despite some opposition expressed in Canada, the Juno Beach Centre at the famous site itself isn't taking issue with the turbine proposal, but it is monitoring the progress of the French consultations. A group in France known as the European Platform Against Windfarms hopes more Canadians will speak out against the planned wind turbines in the coming weeks. "We are just at the beginning," chairman Jean-Louis Butré said in interview from Paris. "We want to protest, very strongly protest." Butré's group - one of the more vocal opponents of the project planned off the coast of Courseulles-sur-Mer - is planning to write a letter to UNESCO asking it to "immediately classify" the D-Day beaches world heritage sites. The group also plans to send letters to leaders of the countries whose troops took part in the D-Day landings. "All this area from Juno, from Sword from Omaha, we will see only wind turbines," Butré said. "If you want to save history of humanity I think it's one of the key sites of the world." The group holding the consultations until July 20 is described as a "neutral and independent" ad hoc commission by France's National Commission for public debate. Eleven open debates are being held, with one on June 12 dealing with the effect on historic sites, the countryside and the environment.